It’s been a while since we talked about chords, so today we’ll hop onto the piano and have a little bit of playtime. We’re going to talk about the three chords to know on piano – or any instrument, really. These aren’t just chords that I think are important. These are the most common chords whether you’re looking at Classical or pop music. 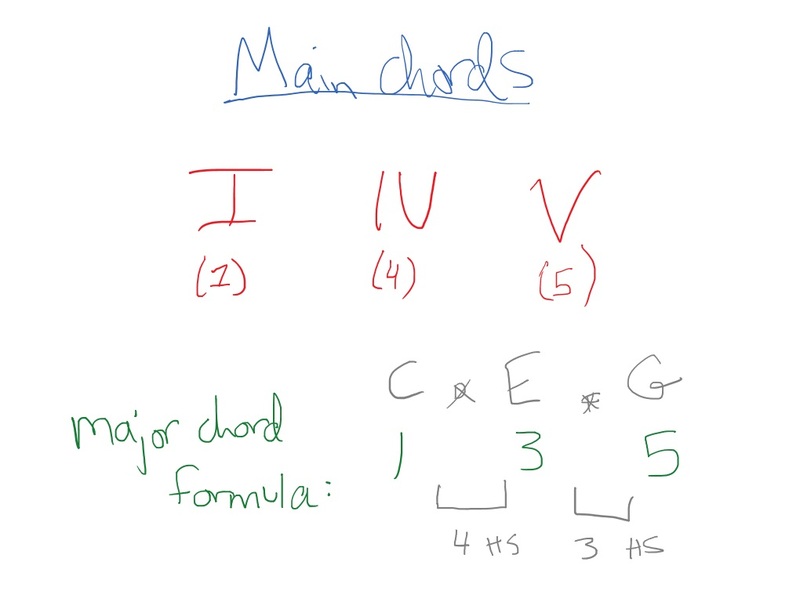 And obviously there are many, many more chords than three, but if you find the topic of chords a little confusing, knowing these three should be a good starting point. I was reading a really interesting blog post that analyzed 1300 pop songs to figure out which chords were the most common, and, when adjusted to be in the same key, the I, IV and V are absolutely the most common. And, of all the chords you could play in the key of C, those are the most important, most frequently-occurring ones to know. This doesn’t just apply to pop music. You’d come across the same thing if you were analyzing Classical music as well – it’s a common, accepted music theory idea that the I, IV and V are your main pinnacle chords. So here’s where the pentascales of the previous video come into play. If you know the first five notes in every key, then you can figure out the I, IV, and V chord of every key. For the time being, we’re just going to talk about major keys – we’ll get to minor keys in a moment. The 1-3-5 represents a triad, or a basic major chord in root position. So for example, C major chord would be C (skip D) E (skip F) G. 1-3-5. So keep in mind that a major chord is going to have 4 half steps between the first two notes, and 3 half steps between the last two notes. Let’s pick a weird key signature to play around with – how about Ab. So our first chord (I) would be Ab. Our fourth chord (IV) would be Db. And our fifth chord (V) would be Eb. Figuring out an Ab major chord is easy, because your hand is already in position, on the notes, ready to go. Let’s figure out our fourth chord, Db. Remember, we need 4 semitones between the first two notes, and 3 semitones between the last two notes. Now let’s do the same thing with our fifth (V) chord, Eb. Again, we’ll start on Eb. Then we’ll wander up four semitones to G, and then 3 more semitones takes us to Bb. I highly recommend you get comfortable with these three chords in all 12 major keys. I know it seems excessive, but even if you just learn one set every couple days, you’ll have learned them all in a month. Not only will it make Classical and pop pieces easier, it’s a good basis for jamming, improv and songwriting as well. It’s good to know chords in minor keys as well, since they’re more or less as abundant as major keys. In minor keys, the idea is the same – the first, fourth and fifth chords are still the most important. The big difference is that instead of all three of those chords being major chords, 2/3 of them are now going to be minor chords. Notice i and iv are lowercase – these are going to be minor chords. But the V is uppercase, which means it’s a major chord. 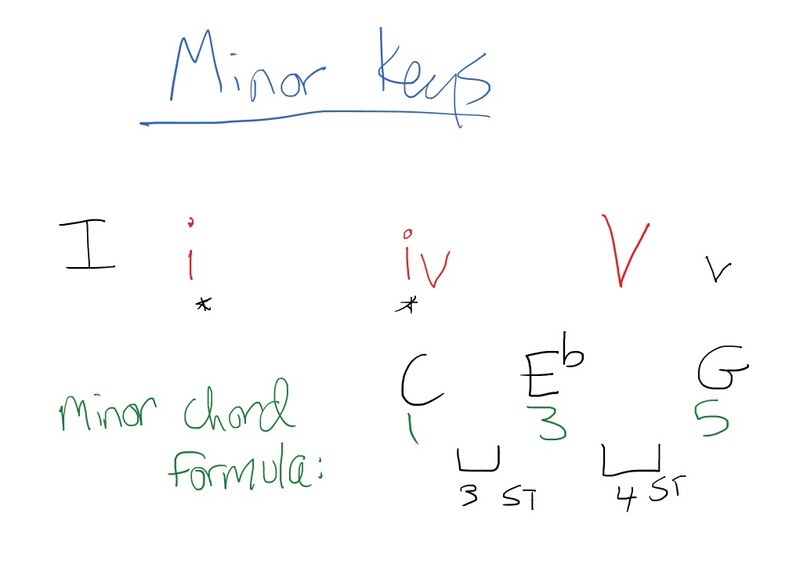 The formula for a minor chord is easy. You just flip the major chord formula around. A major chord is 4 semitones, then 3 semitones. A minor chord is reversed – 3 semitones, then 4 semitones. Next, our minor 4th chord (iv). We’ll be starting on Bb (since the key of F has a Bb, not a B natural). 3 semitones up from there is a Db, and then 4 semitones from there is an F.
So Bb minor chord is: Bb Db F.
Finally, we have our 5th chord (V), which is major this time. I could get into all the reasons why that is, but basically it’s what’s common when you’re playing a song in a minor key. So our fifth note is C, so we need to play a C major chord. This should be easy – I hope you know C major chord at this point! I want to show you a couple practical applications of this knowledge before finishing this video. On the screen I’ve got the song “Sweet Home Alabama”, which is a famous song that basically just uses 3 chords. Guess which chords? 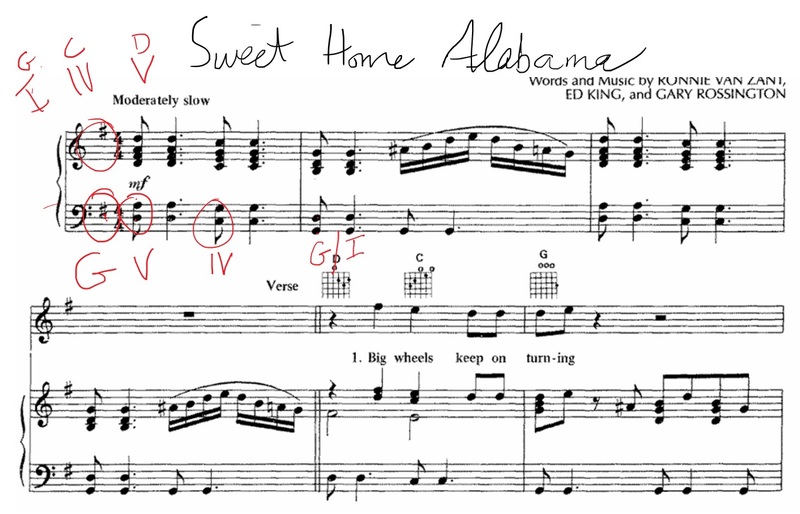 First of all, I’m going to figure out what key this song is in – an F# in the key signature, so it’s in the key of G. I’m not even going to consider a minor key, because I know what Sweet Home Alabama sounds like, and it’s definitely a happy major key. Now let’s take a look at Sweet Home Alabama. The first chord is a D (V), the second chord is C (IV), and the third is G (I). So it’s our three chords, but reversed. Knowing that, I could sit down on the keyboard, use the sheet music as a faint guide (for rhythm direction and for guidance on fills), but mainly improvise how I play it. I could sit and jam out the bass line if I wanted – D D, C C, G G. Then I could add a single-note melody. Finally, I can fill that in with some fills, so there’s not a bunch of empty space between lyrics. Maybe I could flesh the melody out by adding some thirds for harmony. Or instead of playing single bass notes in the left hand, I could play 5ths, or even 158 octaves. No, this guide on the three chords to know doesn’t give you any cheat sheets. I’m a big believer in discovering the answers by yourself, through experimentation and using formulas like the ones detailed above. Generally it’s the information we work for that sticks in our brain better. Good luck figuring out these chords, and I hope you find them as helpful as I do!